"The Green Hornet" was filmed. riding in the back of a chauffeured limousine, heading to his father's newspaper. In that scene, they are heading north on Avenue of the Stars, in Century City (in west Los Angeles). to the right is the InterContinental Hotel, at 2151 Avenue of the Stars. Here is a matching Google StreetView panorama. They then arrive at his father's newspaper, The Daily Sentinel. and this building has been nicknamed "The Death Star". somewhere else for the shots of the newspaper interiors and printing press room. (the southwest corner of 1st & Spring) in downtown L.A., (across from City Hall). Here is a Google StreetView of the exterior of the Times building. Next we see 'Britt Reid' all grown up (into Seth Rogan). throwing a wild party at a hotel. That is The Standard hotel, at 8300 W. Sunset Blvd, in West Hollywood. We then move on to one of the major locations for the film, the Reid mansion. When we first see it, it's his father's home. But after his father dies, Britt inherits it. This huge estate is one of the most expensive homes in the world. 350 North Carolwood Drive, in the Holmby Hills/Bel-Air section of Los Angeles. That's about a mile northwest of the UCLA campus. and was listed for sale at $125 million. Later, we see his father's funeral, where they unveil a bronze statue of his dad. This scene was shot at the Hollywood Forever Cemetery, the final home of many Hollywood stars. It's located at 6000 Santa Monica Blvd, just north of Paramount Studios. and once again at the end of the movie, where he welds the head back onto the statue. Britt Reid begins his crime-fighting career by accident, when he observes a street mugging. He tries to stop it, gets himself is trouble, and is rescued by 'Kato' (Jay Chou). But he finds the experience so invigorating that he becomes the Green Hornet. side of the street, just outside the main gate of the Hollywood Forever cemetery. In the photo above he is looking (east) through the actual sign that reads "Hollywood Forever". - but for the movie, they changed the sign to read: "Elysian Fields". on the sidewalk of the same (south) side of Santa Monica Blvd. speed away, the police car hangs a U-turn and follows them, and a car chase ensues. After a long, violent chase (including a "Ben-Hur"-style wheel-cutter), the cop car crashes. it appears to start. But in reality, the chase takes place about two miles to the southeast. and then heads east on Wilshire. just west of the corner of Wilshire & Kingsley Drive (near St. Basil's Catholic Church). 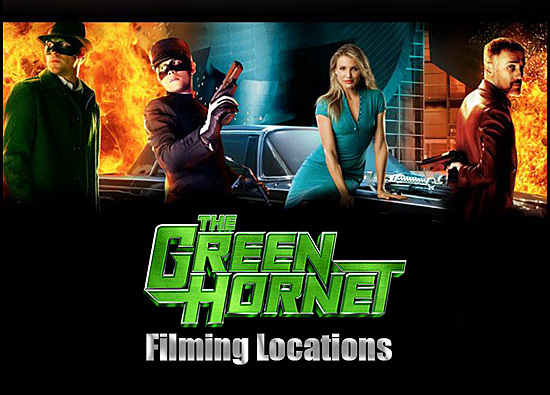 More "The Green Hornet" locations! The photos on this page are stills from "The Green Hornet"